What to do in Fernando de Noronha, Brazil. Or how to keep yourself nicely busy in the paradise Fernando de Noronha. The tourist industry at Fernando de Noronha is very small but the island offers a host of activities for tourists, that you end up longing to vacation on the island longer than you planned. The island’s natural calling is eco-tourism and authorities make sure that the area is protected and preserved in its pristine form by putting in place a number of rules and regulations. So plan your vacation well, to experience the best the island offers. Fernando de Noronha is the place for people with a penchant for water sports, trekking, observing marine life, photography and a marvelous view of nature, to offer. Every place you visit in Fernando de Noronha has an interesting history. While on the island you will have quite a few historical places to visit. Some of the important historical sites are Remedios’s village, Sao Miguel’s palace, Our Lady of Remedies church, quite a number of forts, prisons, colonial houses, museums and some old ruins. Many of the historic buildings are open to visitors, but make sure you check the time before you visit these places. For those who want to explore the underwater world, this island is the best place. However, we suggest that everyone should try diving. There are professional instructors who will assist you with this sport and you can follow them in the waters to a depth of about 12 meters. But if you are a professional yourself then you get a chance to explore deeper. Fernando de Noronha is a very foot-friendly island and for those who enjoy walking, there are a lot of opportunities to walk through sandy shores, rocky cliffs and thick native vegetation. Tourists can take the help of local guides who will lead you on this trail. On the Atalaia trail, you will come across beaches, look out points and natural stone pools. The track leads through narrow and long paths to steep hills, from where you can capture beautiful scenery along the beach. This requires about 5 hours of walking with stop overs for swimming and surface diving. The Dolphin trail will lead you to a 60m cliff from where you can watch the dolphins in action. That is the only thing you can do here, since access to sea here by any means is restricted, but it is worth the climb, especially when you make it early in the morning because that is the best time to see the acrobatic stunts of the spinner dolphins. 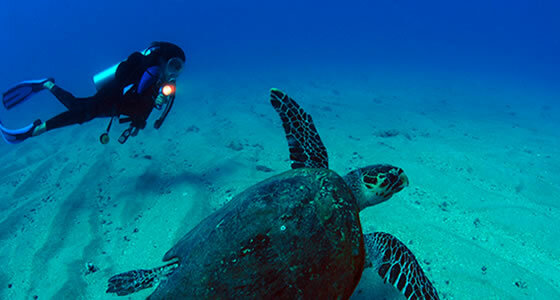 This is one of the best ways to explore the under-water sea life. This is a new addition to the islands many water activities. This activity requires about 2 hours minimum if you really want to check out the exuberance of marine life. All the equipment needed for this kind of diving is provided by professional instructors. For those who love surfing, best opportunities come during high tide. There is the Cacimba do Padre beach where the waves break anywhere between 2 and 12 feet, which makes it ideal for surfing. Praia do Boldro has flat and sharp coral ground that provides best tubes for surfers. The Conceicao beach also has some good swells for surfing.